June 11, 2010 — Gulfstream Aerospace Corp. has received Federal Aviation Administration (FAA) operational capability approval for its large-cabin business jets to fly Required Navigational Performance-Special Aircraft and Aircrew Authorization Required (RNP-SAAAR) approaches to a minimum RNP value of 0.1 nautical miles. The approval applies to large-cabin aircraft equipped with the enhanced navigation package available as part of Certification Foxtrot, Gulfstream’s newest PlaneView™ upgrade, and to pilots who have a letter of authorization from the FAA confirming their ability to fly the predetermined approaches. RNP-SAAAR procedures use global positioning and inertial navigation reference systems to fly predetermined paths that have been loaded onto the aircraft’s flight management computer. The paths, which are navigated using the Flight Guidance Control System, allow pilots to fly safer, more direct and lower minimum approaches. “In general, RNP-SAAAR procedures increase operational efficiency by providing better accessibility to airports located in either traffic-dense areas or where terrain or man-made obstacles adversely affect approach minimums when using traditional instrument approach standards,” said Jake Howard, senior experimental test pilot, Gulfstream. RNP-approved aircraft systems not only navigate with a higher degree of accuracy, they also allow the flight crew to monitor the system’s navigational performance. If a certain performance objective isn’t met, the system alerts the crew. All of this results in improved safety, access, capacity, predictability and operational efficiency. RNP-SAAAR approaches also yield reduced fuel consumption and lower greenhouse gas emissions. RNP-SAAAR is part of the FAA’s performance-based navigation (PBN) initiative, which uses emerging technologies and aircraft navigation capabilities to establish navigation specifications. These specifications are applied to an air-traffic route, instrument procedure or defined airspace and provide a basis for designing and implementing automated flight paths. They also aid in airspace design and obstacle clearance. Once the navigation specifications have been outlined, RNP defines the performance level required to operate in that particular airspace. 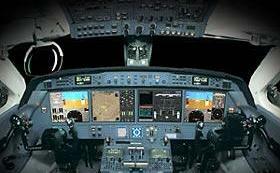 Aircraft must be capable of safely achieving the performance level in order to fly RNP procedures. Gulfstream received operational capability approval to fly RNP-SAAAR approaches to a minimum of RNP 0.3 in late 2007.